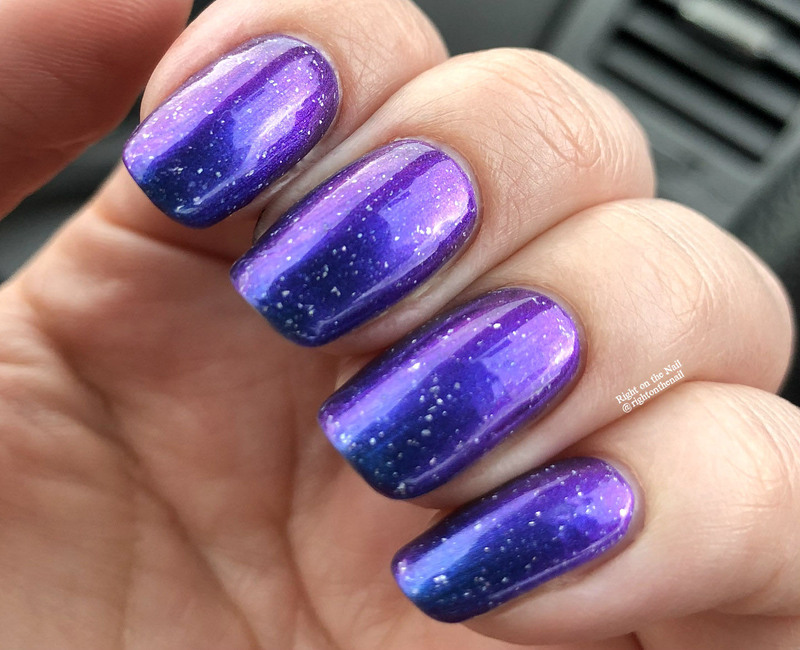 Hi guys, it's going to be a quick post tonight because you have only 3 hours to get this polish before it goes away forever. CbL rereleased 40 Going on 26 for the Polish Pickup Rewind. It is available for just $9 until midnight tonight so get over there ASAP! Leah also just released a new nail and body care line, Care by Llarowe, and I've really been loving the Nail and Cuticle Butter. 40 Going on 26 is a blue/purple/pink multichrome with a silver holographic flake finish. The shift is most apparent in low light which is why I added that last photo taken with my phone. The resolution isn't the greatest, but you can see the shift so much more. The formula was slightly on the thinner side without being problematic, and I needed just 2 coats for full coverage. I should have bought this the first time around, so I was ecstatic to have a second chance. There is no free shipping this month, so the polish was discounted to $9 to make up for that. Find out more about Leah and CbL on their website, Instagram, Twitter, and Facebook Pages while you can learn more about Polish Pickup on their Facebook page and website.